Plant pigment names represent the substances within plants that absorb particular types of light from the sun for conversion into a usable food source for the plant. The colors displayed by different plants are dependent upon the plant pigments within and the colors of light each pigment absorbs. Though the color green initially comes to mind at the mention of leaves, foliage is available in all types of colors like reds and purples. The plant pigment named "chlorophyll" comes from Greek, breaking down into the words "chlorosm" meaning green, and "phyllonm" meaning leaf. As the name states, plants with chlorophyll display a green color. Chlorophyll soaks up the blue and red hues present in sunlight. Needed for photosynthesis, chlorophyll absorbs light for the production of food that the plant uses for fuel. When a plant has a high level of chlorophyll, it reflects the color green, thereby giving the plant a green appearance, according to the Oregon State University Department of Extension & Experiment Station. The plant pigment name "carotenoid" signifies plants containing carotene, an orange-hued pigment whose name comes from the Latin word "carota," meaning carrot. Carotenoids absorb light when it comes into contact with plant leaves. Absorbing blue and blue-green light from the sun, carotenoids reflect the colors they do not absorb including yellow and yellow-orange wavelengths. These reflected colors are picked up by the human eye, giving plants with carotenoid pigments a yellow to orange appearance, according to the Oregon State University Department of Extension & Experiment Station. Pigments named "anthocyanins" are responsible for the absorption of blue, blue-green and green light from the sun. The word "anthocyanin" breaks down into the Greek words "anthos," meaning flower, and "kyáneos," meaning purple. 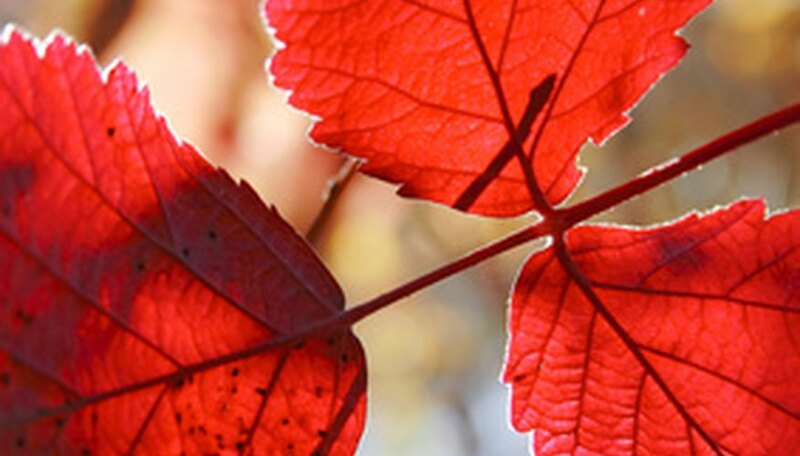 As its name reflects, and due to the colors absorbed, plants with high levels of anthocyanins display a purple or red color, according to the Oregon State University Department of Extension & Experiment Station. Though plants may contain each pigment, the color the human eye observes depends upon the highest pigment level present in the plant. What Is the Function of Chlorophyll in Plant Cells?